Highway driving provides unmatched pleasure to us petrolheads. Whoever coined the phrase "the journey is as important as the destination" must've been a gearhead at heart. 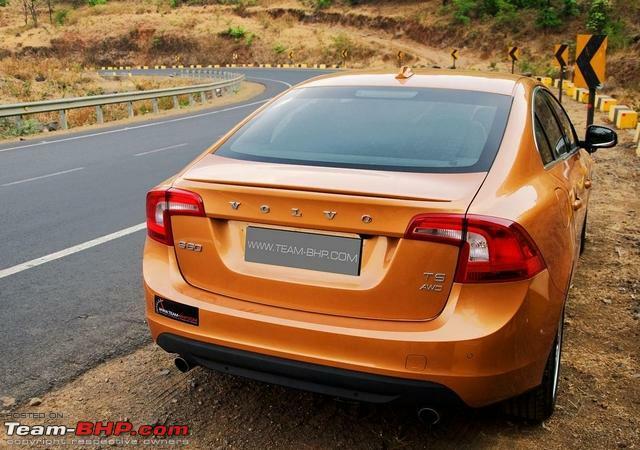 Things have never been better for Indian driving enthusiasts. Cars are getting increasingly competent, road quality has much improved in the last decade, and traveling in India exposes you to unparalleled natural beauty. Unfortunately, India leads the world in road accident fatality rates. Someone dies on our roads every 4 minutes! Rather than the quality of road, you can put this down to poor driving skills, ill-maintained vehicles & awful post-incident medical support. The number of injured people who die between the accident time & them reaching the hospital is shockingly high. Highway driving entails faster speeds & more overtaking. 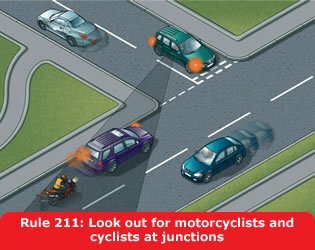 Most accidents occur while overtaking or at junctions. As a responsible, informed car owner who cares about his safety & that of others on the road, it is important for you to follow the best practices listed below. Your car must be in top mechanical shape for a highway drive. Always check the tyre pressure & condition before hitting the road. It's a good idea to visually inspect your car from the outside & under the bonnet too. You should be well rested & absolutely fresh. If you are tired or in a hurry, the highway isn't for you. Wear comfortable clothing and avoid slippery footwear (e.g. kolhapuris). Don't place any bottles on the floor as they can roll and block the brake pedal's movement. Never overload your car with excessive passengers or cargo. Overloading will negatively impact its dynamic behaviour and increase braking distances, due to the greater momentum. An overloaded vehicle might not be able to protect its occupants in a crash either. It is as important for rear passengers to wear their seatbelts as it is for those at the front. Indeed, buckling up could be the difference between life & death for rear bench occupants. If you have a choice, always choose daytime driving over nighttime. The night brings poorer visibility, unlit roads and a higher probability of drunk driving & crime rates. Understand your own limits and that of your car; never exceed them. If you're driving an unfamiliar car (say, a friend's ride), spend some time getting to know its road manners first. Further, beware of the car's blind spots (every car has them). Some cars suffer from poor high speed behaviour, including a sensitive steering, excessive body roll, poor grip levels, weak brakes etc. You must be mindful of the vehicle's limitations. If you’re behind the wheel of an SUV, understand its dynamic limitations vis a vis a low-slung sedan or hatchback. SUVs are more prone to rollover at high speeds or in an emergency manouveur. Also, SUVs simply cannot handle or brake as well as sedans. If you're driving on an unfamiliar highway, increase your margin for error by driving slower than you normally do. Keep the windows rolled up. Being exposed to strong wind & noise for a longer duration can tire you out. There is also the danger from flying pebbles & other foreign objects. Sealed windows are better from an aerodynamic point of view as well. Drive with your air-conditioner in "fresh air" mode. If you prefer "recirculation" mode instead, remember to switch to "fresh air" mode once every 60 minutes or so. Letting fresh air in will keep your cabin's oxygen levels higher and help you stay attentive. Drive with both hands on the steering wheel. While important in the city, it's all the more important on the highway : Do NOT get distracted. Music should be low while passengers ought to avoid loud chatter. Driving on the highway needs your 100% commitment and concentration. Always keep your low beam and fog lamps on, even during the day. It greatly increases your visibility to fellow road users. Being seen is as important as seeing others. Once you hit the highway, gradually increase your speed. Let your mind & body get used to driving at higher speed. Maintain a steady pace at a speed that you & your car are comfortable with. You’ll find that constantly varying speeds make the drive stressful. A steady, consistently manageable pace helps in effortlessly munching those miles. Be aware that your car will behave differently with a full load of passengers & luggage onboard. It simply won't steer, handle or brake as competently. 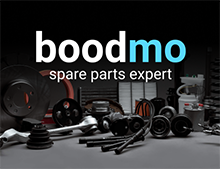 This point is particularly important if your car has a soft or unsorted suspension (e.g. 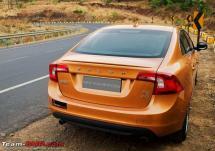 Civic, Verna, Xylo). Drive conservatively when all your seats & boot are full. An expert driver will scan the surrounding area of his car ever so often. Knowing what is ahead, behind and beside you can prove to be invaluable information if you have to execute an emergency manouveur. Use engine braking! It helps in keeping the brakes cool, maintaining car control and setting just the right level of deceleration. NEVER, ever coast in neutral gear or with the clutch depressed. Avoid any sudden actions; that is, sudden braking, sudden turning, sudden overtaking etc. The highway is a place to gradually make your move, after having made your intentions amply clear to vehicles around you. Never overtake or stop at a blind spot on the road (i.e. where other road users can't see you well in advance). Related Thread. Equally, watch out for idiots who are overtaking around blind corners. Road dips create notorious blind spots. Be extremely cautious when approaching a road dip as it could be hiding a vehicle speeding toward you. Use your indicator *only* to communicate the direction in which you intend to go. Some drivers use the right-hand-side blinker when it's safe to overtake them. Please refrain from this silly & counterintuitive habit. If you want someone to overtake you, use the left-side blinkers and move out of the way. Remain alert. Watch out for stones & other unwanted objects on the road. Don’t stick to the rightmost part of the right lane. Rocks & debris usually collect there. If you should come across an animal going perpendicular to your path (e.g. cow), always try to pass from behind it. The probability of an animal moving forward is substantially higher than it moving backward. Drop your speed to 50% or less when crossing junctions & villages. After driving for a while, 100 kph doesn't feel that fast anymore, as you get used to the speed. This is called velocitization. Remember to considerably lower your speed when re-entering the city (at the end of your trip) too. Watch out for unmarked speed-breakers. These are a nuisance on Indian highways and are usually found before junctions, bridges and villages. If you hit a large one at speed, it could lead to loss of control or severely damage your car. If you are forced to come to a dead stop on the highway (e.g. traffic jam), switch your parking lights on and keep your foot on the brake pedal (so that your brake lights are lit up). This will sufficiently warn the cars approaching behind you to slow down and avoid rear-ending you. Take your sunglasses off before entering a tunnel (you’ll be surprised at how many drivers make the mistake of leaving them on). Be extremely cautious in tunnels. On a bright day, it'll take your eyes a moment to adjust and regain vision in the dark tunnel. Be considerate to others on the road. Above all, treat them as you would like them to treat you. Be especially sensitive to pedestrians & two-wheelers. A knock at 80+ kph leaves little chance of survival for them. Keep a safe distance from the car ahead and stick to the 4 second rule. Do NOT tailgate. The higher the speed, the more room you’ll need to safely come to a stop. Another advantage of keeping a safe distance is, commercial vehicles dislodge and kick up stones at times. A safe distance means you have superior visibility of what lies ahead. Always prepare for the worst on Indian highways, due to the lack of civic sense. See a Jeep parked on the left? Be prepared for him to suddenly move out & into your lane. Driving on a lone, dark highway? Be prepared to come across trucks with none of their rear lamps working. See a 3-wheeler at the median? He could start his U-turn just when you approach him. Stay ready for vehicles driving on the wrong side of the road. 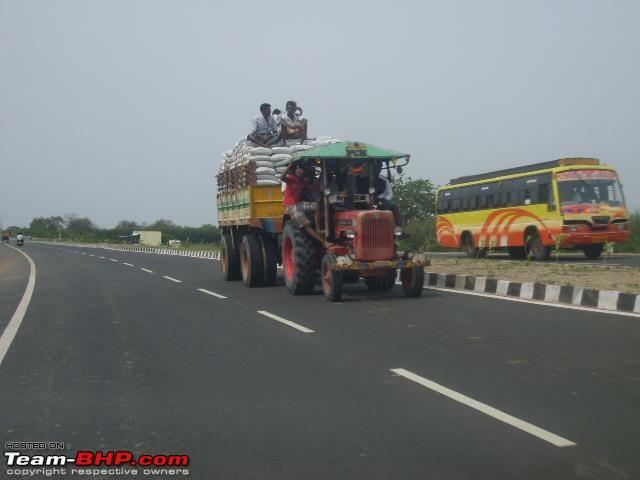 In rural India, you’ll frequently see tractors, three-wheelers & bikes going the other way. Avoid driving right beside a commercial vehicle for long. If it has to suddenly swerve, the truck will knock you off the road. Also note that trucks have much larger blind spots and the driver is less likely to see your vehicle when making a manouveur. The brake-lights of CVs are usually broken or covered with dirt, so you won't get sufficient warning of them braking. Rear-ending a truck can be fatal, as many of them don't have underride protection bars. Translated, your vehicle is likely to submarine under the truck, allowing its rear to penetrate the top half of your car's passenger compartment. Get tail-gaters off your back. If you brake heavily in a C-segment sedan, there is no way that the rusty bus right behind will stop in the same distance. Either lose the tail-gater or let him overtake your car. Whenever you brake, gauge the speed of the vehicle behind you. If you think he might run into you, consider moving safely out of his path to the left or right (if possible). Avoid driving in the leftmost lane for a long duration. You’ll often see stranded trucks, Jeep taxis and others stopping without any warning here. The leftmost lane is also where 3-wheelers move along at a snail's pace. Did someone just make a horrible move and cheese you off? Doesn’t matter. Drive on. Don’t roll your window down to argue. Rural India can be a lawless land. If there is a rashly driven car or commercial vehicle around you, let him by. Don’t let it bruise your ego. Your life is worth it. Too bad the dimwit doesn't realize the same thing. Stay tuned in to what's around you. If you see several brake lights come on in the distance, start slowing down ahead of time. If you see the vehicle ahead of you swerve suddenly, be prepared to do the same. If you see dogs fighting on the side of the road, slow down in preparation for one to be chased across your path. 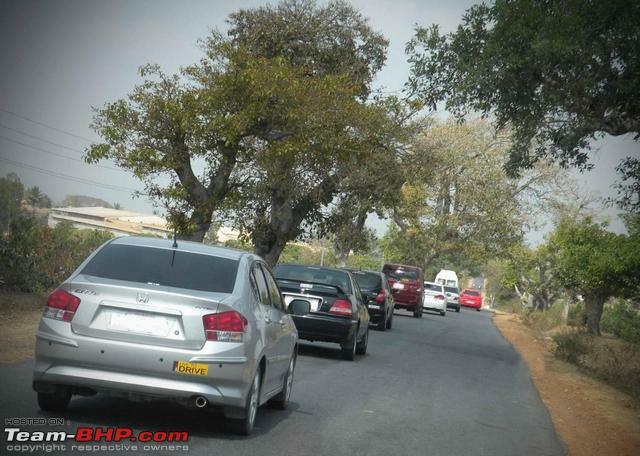 Driving safely on Indian highways is as much a game of prediction as it is of reaction. If you see a stationary bus on the side of the road, be cautious when passing it. The bus' passengers could be crossing the road, and won't see you because of the bus blocking you out. You might think you're a perfect driver, but don't forget to leave a safety margin for other people’s mistakes. On an unfamiliar highway or one with dense traffic, you'll be amazed at how stress-free a "sweeper" car can make the journey. Use a lead car that’s well-driven and follow it at a safe distance. Our family calls this car the “sweeper” car as it will clear traffic for you, and also give you ample warning of unmarked speedbreakers, potholes and sharp corners that you might have otherwise been unprepared for. This relationship becomes even more beneficial at night and when visibility is poor. Of course, don’t follow a lead car blindly. If he drives off a cliff, you don’t want to follow him down. Do keep in mind that the sweeper car will be aware of you following him, and might want to swap positions after a while. Golden Rule : If you hesitate, don’t do it. As Moderator Jaggu once said, your overtaking manouveur should be short, smooth & sweet. Never overtake until you have an absolutely clear view. 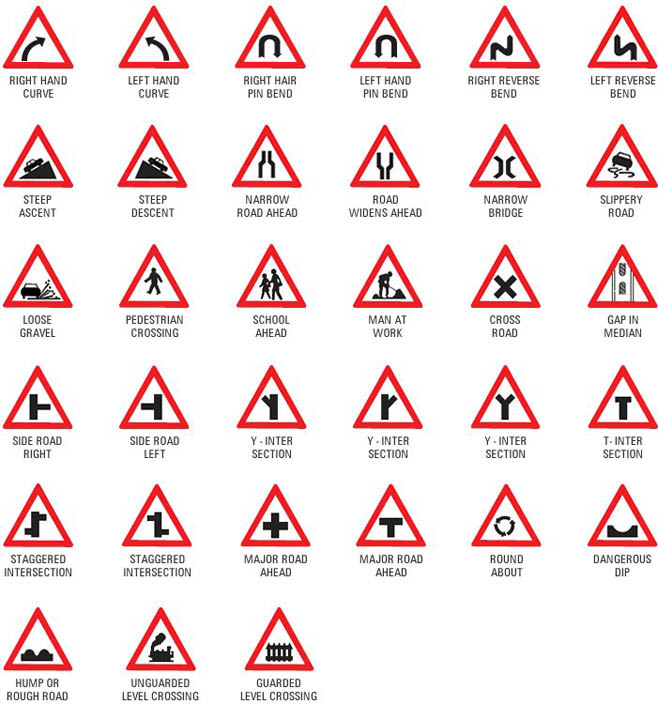 This also means that overtaking on curves & blind spots is taboo. Maintain an adequate gap from the car in front. This will lend you a superior view of oncoming traffic (vis a vis swerving out dangerously to take a look). The right way to overtake is to downshift and prepare your car before moving out. The advantage of leaving a sufficient gap is that you can begin to accelerate earlier. When you pass the vehicle, the speed difference is significantly higher and the overtaking move quicker. Honk briefly while overtaking to intimate the vehicle of your intentions. It's important to let your presence be known as many vehicles don't use their ORVMs! Before overtaking, also look behind you, using your mirrors. It shouldn’t be that a faster car is overtaking you, and you move out into him. Before overtaking, gauge the speed of that oncoming car. The vehicle might seem to be far away, but if it's traveling at 150 kph, it’ll meet you sooner than expected. If you see an obstruction in the way of the truck you are planning to overtake, abandon the move. The truck might have no choice but to move to the right (to avoid that obstruction). You have to think ahead and ensure that the truck you are overtaking has no reason to move to the right (and into you). Don't plan to overtake more than 1 vehicle at a time. The worst situation is to lack room to come back onto your side of the road... leaving you stranded in the line of fire. Use the left indicator when you are coming back into your lane (after overtaking). Avoid overtaking from the left side of a vehicle. Never overtake as a group or blindly follow the car ahead of you in an overtaking manouveur. The car ahead could have calculated just enough space for himself (and not you). This is a very common cause of overtaking accidents on Indian highways where drivers cut it fine. Worse still, the driver might have miscalculated and be headed toward an accident. Some drivers mistakenly use the right-hand-side blinker when it's safe to overtake them. This is a dangerous habit that you shouldn't trust. Reason: the vehicle ahead could actually be indicating (correctly) that he is about to turn right, and it would be disastrous if you were overtaking as he began turning right. If overtaking a commercial vehicle, you could be in the blind spot of another vehicle joining the highway. For precisely this reason, strictly avoid overtaking at junctions. The blind spot is perfectly illustrated by this image from the Cabinet Office's website (UK). Picture Source. Go down a particular decline in the same gear that you'd choose to climb it. Make liberal use of engine braking. This helps in keeping the brakes cool, maintaining car control and setting just the right level of deceleration. NEVER ever roll down a decline in neutral gear. Don't let the car gather too much momentum when going downhill. Control it by choosing the right gear and engine braking. Yield to vehicles going uphill, as they have the right of way. This is because it's troublesome for them to lose momentum and restart while ascending. Be considerate. Honk whenever you are entering a blind turn. Assume the worst; a speeding bus could be coming your way on your side of the road. Slow down, especially on winding roads. Not only will this enhance safety, but it will also prevent your passengers from getting car sick. Stick to the left & never overtake on a turn. Also, never overtake from the inside of a truck on a steep bend. He will squeeze you in!! Trucks, especially longer flat-beds and those carrying liquids, tend to use more than just one lane on turns. Reduce your speed before the curve, not in it. For one, it will help your car cope with an emergency manouveur better. 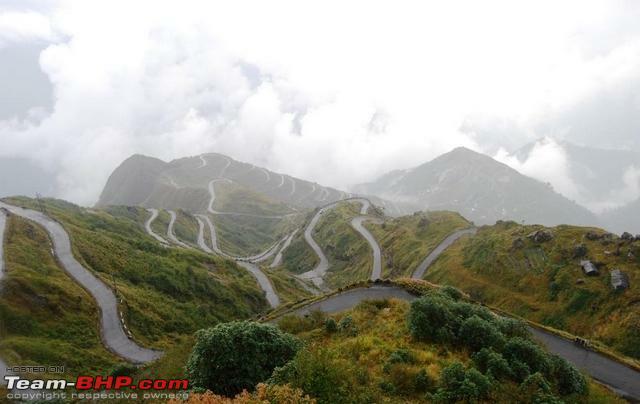 Second, there is a possibility that the turn is sharper or steeper than you originally anticipated it to be. Don't drive on the absolute edge of the road. This area usually offers poor traction. Also, you need to leave some margin for error. Worse still, it might just give away if it's loose ground. Depending on your car's power-to-weight ratio or if your engine is running out of breath on steep inclines, switch the air-con compressor off. This will free up a little more power for the climb. If you happen to stop behind a commercial vehicle, leave a wide gap in between. The truck will inevitably roll back when it tries to get going again. If you happen to stop on an incline, use the handbrake when starting off, to prevent your car from rolling back. Do NOT slip the clutch to hold your car in place. It will burn your clutch out. If your brakes are fading (becoming weaker), stop safely off the road, at a spot where uphill & downhill traffic see you. Take a break and let your brakes cool off. If your car has driver's seat height adjustment, don't set it too low. This will cut your visibility on steep inclines and road dips. Always park OFF the road, away from passing traffic and with your parking lights on. Stop every 90 - 120 minutes and step out of the car. This aids blood circulation and keeps you fresh. Good for your car too. 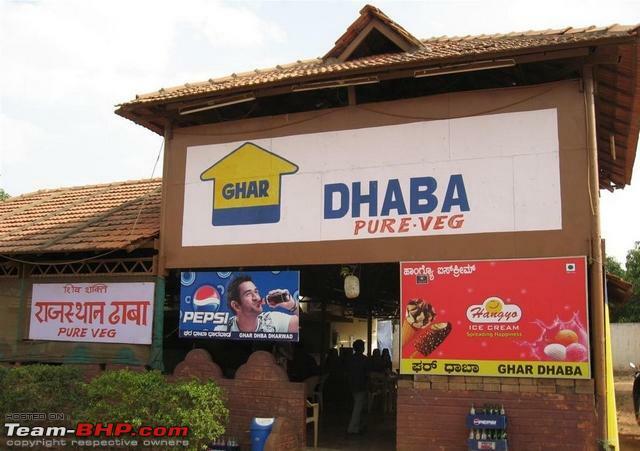 Enjoy the awesome chai at highway dhabas. Clean your headlamps, tail-lamps, ORVMs and windscreen each time that you take a break. Make any adjustments (steering, seat etc.) only when stationary. A slight unintended yank on the steering at highway speeds can have catastrophic consequences. Sip on water ever so often. If you don't, dehydration will easily tire you out. Be sure to park & eat at "family safe" places only. Worried about which restaurant serves good food? Use herd mentality. A restaurant with many cars in the parking lot usually has a good reputation. Avoid overeating, it'll only make you drowsy. Eat till you are ~70% full. Fill up when you have minimum 30% of fuel left. Don’t risk waiting for the needle to hit reserve. Fill up at company-owned-company-operated petrol pumps or those that the local folk are using. Be considerate toward the needs of women in your car and stop where clean restrooms are available for use. If you’re sleepy, best to let someone else drive. Or park at a safe spot and take a nap! Don't take this point lightly. You’ll be amazed at the number of “confident” drivers ending up in crashes because of drowsiness. Happy road-tripping! India is a land with immeasurable beauty, much of it untapped for you to explore. Head out and have some fun. Be sure to treat your car to a full wash (underbody included) at a nearby petrol pump when you're back home. Highway Driving Etiquette & Rules. Tips for driving on Hills. Blind Spots to watch out for.